People hold signs during a labor strike by Kaiser Permanente nurses on Tuesday, March 15, 2016. 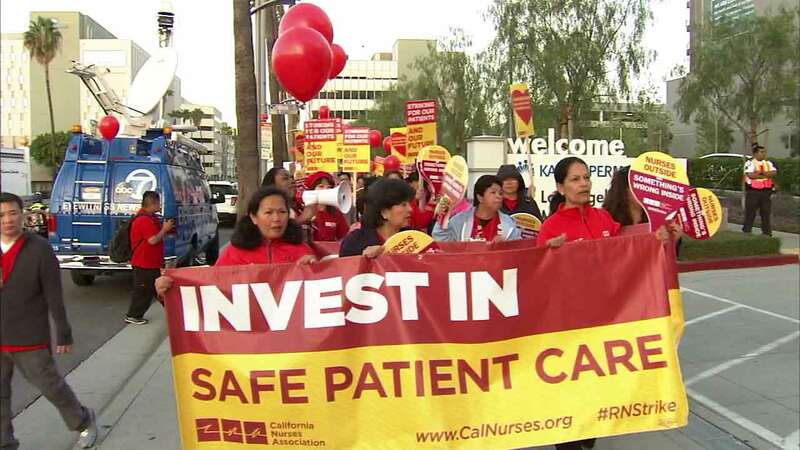 LOS ANGELES (KABC) -- Hundreds of nurses walked off the job Thursday at Kaiser Permanente's Los Angeles Medical Center. It's the beginning of a four-day strike and the second walkout in three months. The nurses took part in a weeklong walkout in March. According to the California Nurses Association/National Nurses United Union, the strike is a push for more pay and increased staffing levels to improve patient care. Union officials said staffing is inadequate in the Tertiary Care Center and the Pediatric Intensive Care Unit, which does not allow nurses to take rests and meal breaks. However, Kaiser says nursing staff ratios already meet or exceed state guidelines, and the quality of care has never been higher. They described the strike as an "entirely inappropriate attempt to disrupt patient care or service as a bargaining tactic." Kaiser also claims its offer makes the nurses among the highest paid in Southern California.